"The mark of champions and the type of victory that wins you titles." Liverpool left it until the 90th minute before snatching a winner against Tottenham to climb back above Manchester City at the top of the Premier League. But do the statistics back up the claim that late goals win you titles? In eight of the past 12 Premier League seasons the team who have scored the most - or joint-most - goals in the last five minutes of games have gone on to win the title. In the 2011-12 season, Manchester City scored 16 times in the last five minutes of games, including Sergio Aguero's famous goal on the final day, the highest tally of any title-winner in the Premier League era. But the statistics are less revealing when looking into late 'winning goals'. On only five occasions out of the 26 Premier League seasons has the team that scored the most winning goals in the final five minutes been the side that went on to win the title. However, if that stat muddies the waters, what is clear is Liverpool are in a far better position in this season's title race because of their habit of scoring late goals. 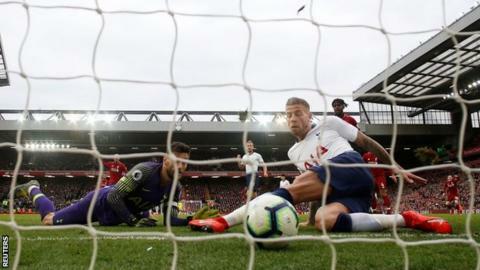 Toby Alderweireld's own goal on Sunday handed Jurgen Klopp's side a third winning goal in the 90th minute in the Premier League this season. No side can better that statistic. They have gained five points through goals in the final five minutes of games this season. In comparison, Manchester City have not gained any. *Despite Liverpool scoring three winning goals in the 90th minute they have only gained four points from those wins rather than six as one of those goals was scored in the 4-3 win over Crystal Palace. Sadio Mane scored to make it 4-2 before Palace pulled a goal back to make it 4-3. Mane's goal proved to be the winner but Liverpool did not 'gain points' as they were leading 3-2 going into the 90th minute. Their fifth point gained in the final five minutes comes courtesy of Daniel Sturridge's equaliser against Chelsea in September. Speaking of late goals, Chelsea ended their long wait for a last-minute winner in their 2-1 win at Cardiff. They had not scored a winning goal in the 90th minute of a Premier League match for more than five years until Ruben Loftus-Cheek headed in on Sunday. The last Chelsea player to do so was Frank Lampard against Everton back in February 2014. In that time Tottenham had scored nine 90th-minute winners, suggesting the place to be for late drama in recent years has been north London rather than west. Loftus-Cheek's goal does however take Chelsea clear into fifth place in the list of most 90th-minute winners in Premier League history, on 21. Liverpool lead the way with 33. And it should come as no surprise that the Blues did come from behind to win against Cardiff. The Welsh side have scored the first goal in all four of their Premier League games against Chelsea and lost all of them. Should Wolves' season be even better? Wolves' defeat by Burnley on Saturday will not take the shine off their impressive first season back in the top flight - they remain seventh in the table and play an FA Cup semi-final next weekend - but it does add to a peculiar trend. It was the fourth time they have been beaten by a team currently in the bottom four of the Premier League, meaning they have now lost more games against the bottom four than they have against the current top six. Is it fair to say Wolves' excellent campaign could, even should, have been better? In all they have only taken seven points from seven games against the bottom four. Had Wolves won all seven of those games they would be 14 points better off and just three points off the top four. The biggest attendance in British football this weekend came not at Old Trafford, Anfield or Celtic Park but instead at Wembley Stadium for a game between two League One clubs. There were 85,021 people at the Checkatrade Trophy final between Portsmouth and Sunderland on Sunday - a new record for the competition. Not only was that attendance the highest in England, it was the second highest across Europe this weekend, bettered only by the 92,795 for Barcelona v Espanyol at the Nou Camp.